COMPETITIVE LEADERSHIP - 12 Principles For Success! 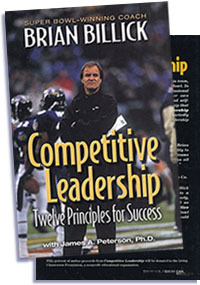 ..Brian Billick, who guided the Baltimore Ravens to victory in Super Bowl XXXV in only his second year as head coach, has quickly earned a reputation as one of the best leaders and motivators in the NFL. He led his team to football's Holy Grail against long odds and tough adversaries. ..But Competitive Leadership is not about football. It is a tool for those who aspire to reach difficult goals in their own lives, Coach Billick shares his 12 personal principles for building effective leadership skills. He will teach you how to use these principles in order to become an effective leader. 1) How to deal with change and unanticipated problems. 2) The value of independent thinking. 3) How to create your own opportunities. 4) The importance of lifelong learning. 5) How to inspire confidence in yourself and others. Competitive Leadership will be an invaluable resource for business executives who want to focus and energize their employees, team members who want to be more effective contributors to their organizations, and anyone who wants to improve their leadership skills. With this unique learning tool, you'll see the results - the truest measure of an effective leader. "Brian Billick is an incredible leader... Competitive Leadership is an entertaining, inspiring, and important book. I wholeheartedly recommend it for anyone wishing to develop personal leadership goals." ...Jim Fassel, Head Coach, the New York Giants. "Results are the truest measure of an outstanding leader, and Brian Billick's leadership style... ensures that his teams will produce outstanding results for a long time to come. We can all learn a lot from his book." ...Ed Walsh, Senior Vice President, Campbell Soup Co.
"If there was a Super Bowl for business books, Brian Billick would deserve another ring for this one ." ...Roxanne Spillett, President, Boys & Girls Clubs of America.